Do you like to enjoy a cup of cappuccino during a busy day, to have a few minutes to relax and to catch your breath? 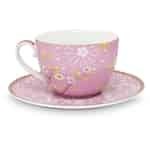 Then why not drink it from this attractive cappuccino and saucer set from Pip Studio. 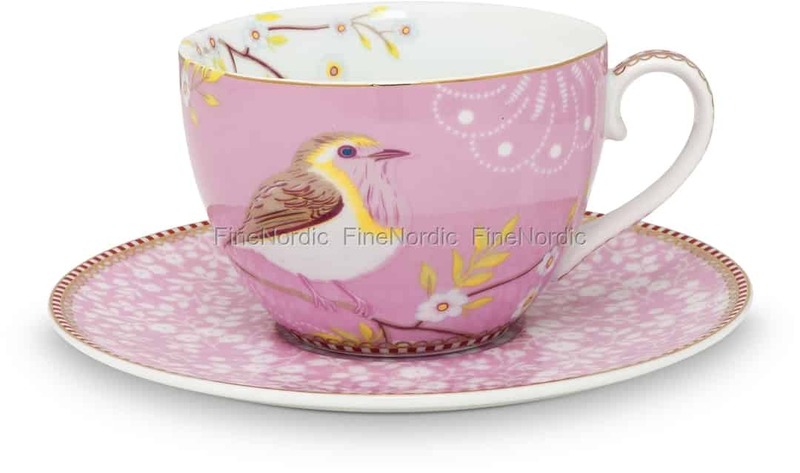 The pink cappuccino cup from Pip Studio’s Early Bird series is adorned with a bird and beautiful blossom pattern which also partly continues into the inside of the cup. The saucer is covered in lovely little flowers and around the edge of the saucer and the bottom edge of the cup you can see Pip Studio’s distinctive red and white stripe with golden details. 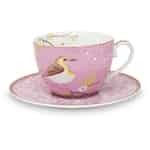 And when you have finished your cappuccino from this lovely cup, then you’ll be ready to conquer the rest of the day! We have a nice selection of Pip Studio Early Bird tableware available in our web shop, also in the colors khaki and blue, so you can mix and match as much as you like and to make the table look even more interesting.